Do you have a friend or family member who doesn’t want or need any material gifts? How about buying some needed medical equipment in their honor instead? You can make a huge difference and give a gift that matters! 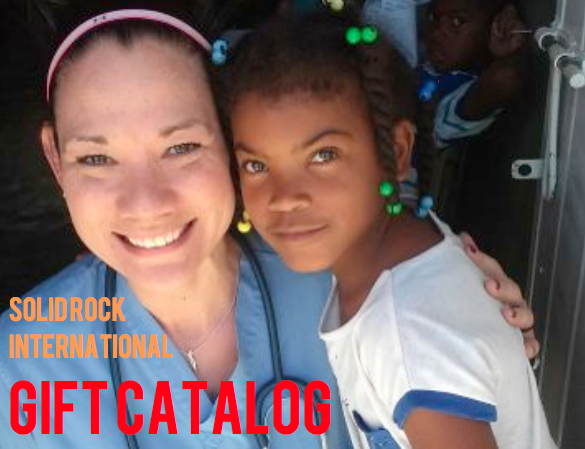 Take a look through the Solid Rock International REVOLUTION Gift Catalog and consider purchasing some medical equipment for the new clinic in San Juan! Solid Rock International is blessed to be in partnership with IMEC (International Medical Equipment Collaborative) as they will provide refurbished equipment for a great price. Each room in the clinic will be packed and sent as a complete suite that will be ready to use upon arrival. 1. CHOOSE A GIFT: Select a gift from the REVOLUTION Catalog. 2. DONATE: Mail a check and the order form from the back of the catalog to Solid Rock International, PO Box 20867, Indianapolis, IN 46220 or donate online and call/email the office to indicate which gift you have chosen. Any questions? Call our office at 419-956-4077 or email Megan at mhendon@solidrockinternational.org. Or request your catalog by contacting us.